Water is important in the west, mostly because through much of the west there is no water. 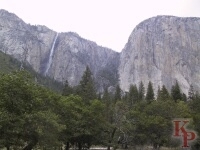 Yosemite valley is a prime location for falls because of its geological history. The near vertical walls of the U-Shaped glacial canyon provide many opportunities for falls and cascades, indeed Yosemite Valley has the greatest concentration of high falls in the world. Some are famous, some are rare, all are worth stopping to see. May and June are the best time to see them, and many are gone by July. The falls range from the very visible Bridalveil -- which provides the water accent on all the views from Inspiration Point and its related locations -- to the rarely seen, almost hidden Sentinel -- which is just behind Bridalveil. To the seldom seen Horsetail. 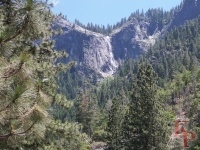 (Story on Horsetail Fall -- a few minor errors in the first version of it. But mid to late February is the time for the glow.) Yosemite Falls provides a backdrop to many of the views from the meadows, along the river, or from the Yosemite Lodge area. Vernal and Nevada are visible together most clearly from Glacier and Washburn Points, but are best experienced from the Mist Trail (which in early season might better be called the rain trail, since you will get very wet). Generally the plural (falls) is used, though in cases where there is only one drop the singular (fall) may be proper. Vernal Falls, 317 Feet. No wonder there is Mist. The first view is from the footbridge (1.6 miles round trip from the Happy Isles shuttle stop). There is a fairly high railing at the top, but no barrier stops people intent in getting around it. The river is swift and the rocks are slick. Playing in the water above a falls is never a good idea. Mist Trail, you get wet in June. The Mist Trail can be steep and slick, so be careful and be prepared. 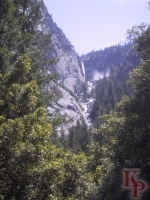 The total hike to the top of Vernal Fall is about 3 miles round-trip, with a 1000' elevation gain (i.e. very steep). The mist is refreshing in the summer. Nevada, 594 Feet. Of course that is 594 down from here. The trail to the top is about 7 miles round trip (using the Mist trail), plan 5-6 hours, have lunch. The river approaching the fall is swift and the rocks are slick. Nevada is high (upper), Vernal is green (moss in the mist). This makes it easy to keep straight. Illilouette Falls, 370 Feet. Illilouette is at the head of a canyon on Illilouette Creek, so the easy views are from the lower Mist Trail -- below the bridge. Up close, from the top or across the canyon, you can't see the whole drop. The Panorama trail from Glacier Point to the Nevada Fall leads past the top of Illilouette. Sentinel Falls. Total 1920 Feet. Water runs only in the spring and early summer in wet years, and then only during snow melt. Sentinel Creek (draining the Sentinel Dome area)is not very large at any time so there is not a lot of water available. The best views are from the south side road or the trails in the meadow. Look up to Sentinel Point toward Sentinel Dome or you'll miss it, but usually it hides behind trees or is not flowing. Lehamite Falls. Total 1180 Feet. Spring and early summer in wet years. Visible above Yosemite Village from the west. Bridalveil Fall. 620 Feet. In the early season it provides an accent to pictures from the standard views at the tunnel. 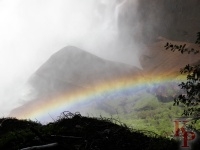 In the early season it is a strong falls, late in the year it is much more a wispy bridal veil. The base of the falls is about a 0.5 mile round-trip walk from the parking lot. While the shuttle does not go the the parking area, the walk from the closest stop on the lower valley (El Capitan) shuttle is not much more than the walk from the parking lot. At peak times cars are turned away so the El Capitan Shuttle may be the best access to the bottom of the falls. Up close it is like any water fall, with the best views from the tunnel view point, or one of the meadows (with turnouts) on either the north or south loop road. Ribbon Fall. 1612 Feet. Another early season falls, on the west side of El Capitan. From the road or trails there are a few good places to see it (the best is the Bridalveil veiw turnout on the South road, after looking at Bridalveil, turn around and look). 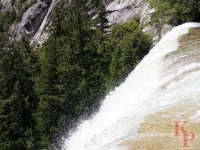 Described by some as the highest free-flowing (single drop) falls in Yosemite. Silver Strand. 1170 Feet. An early season falls. The easiest place to see this one is from the Tunnel View parking lot. The base is behind the trees. 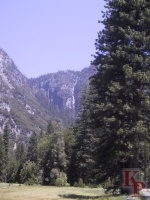 You can also see it from varisous points on the Crane Flat road as you drop into the valley. Also Wampama in Hetch Hetchy Valley Over 1000', along with Tueeulala and Rancheria Chilnualna Fall near Wawona Horsetail -- East side of El Capitan Famous for the glow at sunset in late February.